“Oh come on! It’s only me” Indeed it was only Vin Scully the long time announcer of the Los Angeles Dodgers. How long is long time? How about 67 years! Who does that? How many people have you ever heard of did a job for 67 years? After 67 years the day came when Vin was finally getting honored. The ceremony was before a Dodger game and the place was packed. Many of the people that Vin had touched through the years were there to speak. One of them was a great pitcher of yesterday named Sandy Koufax. Sandy had an up and down career. In his case it was more down and up. His first 5 years in the league he was a troubled left handed pitcher who barely won as many as he lost. Then miraculously he found himself and for 5 straight years was the best pitcher anyone had ever seen! Then at the tender baseball age of 30 Sandy retired. Arthritis in his left pitching arm had led to his elbow swelling up every time he pitched. It didn’t affect his great pitching, but made life very painful and Sandy had had enough. Sandy now 81 talked about Vin and what he meant to him. He mentioned how the Dodgers had another great announcer before Vin in Red Barber. Sandy thought Red was pretty good but he rated Vin very good. They became friends through the years and Vin has a special place in Sandy’s heart. You see Sandy has lived his life after retirement far away from the public eye on purpose. Only as a tribute to Vin was Sandy willing to get before the public again. Sandy told the story about when the Dodgers moved from Brooklyn to Los Angeles in 1958. It was in those early home games that Sandy notices while pitching that the voice of Vin was all around him. Fans had paid Vin the ultimate tribute by bringing their transistor radio’s to the games. 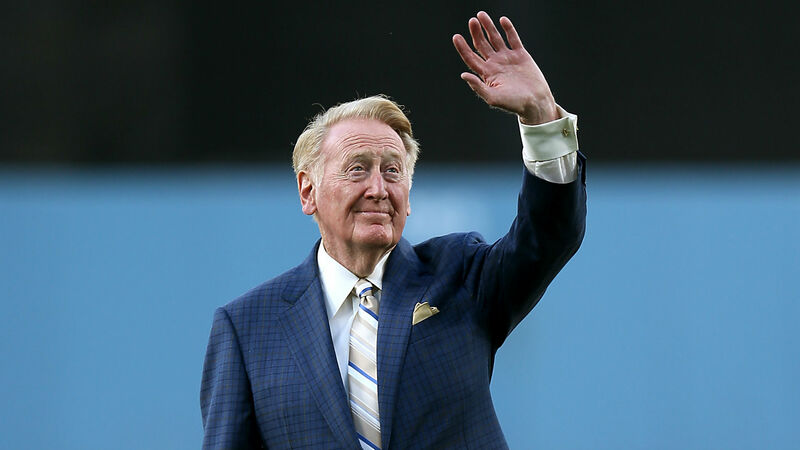 They were saying “We like to see the game with our own eyes, but we also like to hear the gentle voice of Vin describe it in his own way to us!” It was Vin describing Sandy behind the microphone as Sandy performed his greatest feats. In the 1965 World Series he described Sandy’s every movement on the mound as he maneuvered his way through the Twins order without his best curve ball. In fact he wasn’t able to get it over the plate at all and relied on his fast ball constantly. Vin led us up to the big moment and when Sandy recorded the final out Vin was silent. His style was to let the picture and the fan noise take over. It was telling a story and his silence invited us to drink in the moment. After the game in the locker room Vin was interviewing Sandy about a statement he had said earlier. “Sandy, After the last game”, Vin began “you said you felt like you were one hundred years old. How do you feel now?” Sandy quickly answered his old friend “A hundred and one” That question in retrospect was what Vin was about. He wasn’t always trying to get the strategy out of the player as much as he was getting the person out of the player. We always hear announcers describing games, but Vin had a knack of describing people. Earlier that year Sandy had thrown a perfect game against the Cubs. Twenty Seven batters came up that day and twenty seven went down. It is rare for an announcer to be able to describe a perfect game, but ironically I am sure that Vin called many perfect games. They weren’t perfect in the baseball world. The pitcher invariably gives up a hit, walk, and run. Still the job Vin did in his broadcasts describing the action was perfect! From the beginning Vin had his own style. Not only did he describe what was going on in the games, but he was a friend and a story teller. He did his homework and got to know the players personally. He would tell us the inside information about a players personal life and how it related to the big game. He could tell us what the player was probably thinking because he had asked them beforehand what they thought about in certain situations. Vin always described in kind of a sing song tone that was comforting and came across as someone we could trust. They say that imitation is the sincerest form of flattery. There is an announcer broadcasting games in Japan that gives Vin that highest compliment. Even though his broadcasts are in Japanese if you listen you will notice that same sing song tone that Vin has used the last 67 years. It seemed appropriate that Kevin Costner who starred in baseball movies Bull Durham, Field of Dreams, and For the Love of the Game would conclude the tribute with this moving speech to Vin Scully. “We will miss you, my friend. We will miss you in our radio, in our cars, in our backyard. You’ve been a gift to Los Angeles and to baseball itself. It seems forever that you’ve been guiding us through your personal window into the game. Vin was a voice of reason. When it was hard for Dodger fans to watch because of the tension of the situation, it was Vin with his ever pleasant voice that led them through. That is how God wants to lead us through trying situations. The Bible states that “My sheep hear my voice.” It is very peaceful to hear God’s voice and know that all is well no matter what is happening. Very nice and inspiring story Lewis! Thank you.